This luxury apartment, situated in a quiet location right near the fjord, meets all your expectations of a wonderful holiday accommodation. 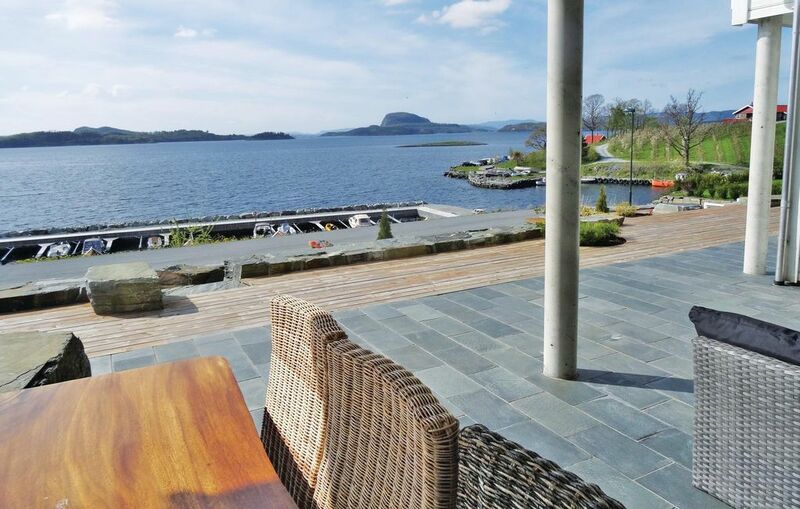 It offers panoramic views of the fjord and the mountains. There excellent swimming and fishing opportunities nearby. There is a fine sand beach right at your doorstep. There is a terrace and a garden with a barbecue and quality garden furniture. Children are also welcome here. There is a private area with a boathouse and a jetty. A place for cleaning and filleting fish is located near the fjord. The area also offers good hiking opportunities. Do not miss a visit to the Kongeparken and Stavanger. You can go on day trips to the Lysefjord and the Pulpit Rock. The house is located next to N16100. Extra boats of different sizes can be booked in advance or when you arrive. Wonderful vacation spot for the family. This was our first visit to Norway and how wonderful to have found this house on the Fister Fjord. Beautiful sunsets, tranquil seas and very relaxing home were great attributes for my husband and me. Boating, fishing, hiking, swimming and a playground were great for our children and granddaughter. The house was very clean and modern. The security system was easy to use. We would definitely go back.